INCinema’s Award-winning indie film “Walang Take Two” (No Second Take) directed by award-winning director Carlo Cuevas definitely making some noise. Early this year, the film were recognized from London International Film Festival to Jakarta Film Festival and bagged the Best Film and Cinematography from Madrid Film Festival. Apart from that, the indie film from the Philippines has come along way, “Walang Take Two” is the official selection for International Film Festival of Manhattan in New York City on October 20, 2016 and chosen as the opening film in Manhattan. In addition, also nominated for “Best Ensemble Acting Award” for feature film. Cuevas said,” I am so thankful and bless that Walang Take Two won all these awards, I dedicate this award to all the staff and the team” . “There are no second takes,” is what Hapi, a frustrated film director, always hears from his father Mang Julian, a retired videographer. Together with his best friends, Caloy and Onyok, he searches for potential producers who will finance his movie script. Out of options, they borrow from a known local loan shark named Alfajor, only to be stolen by the mischievous Oblax. Striving to fulfill his dreams, looking for ways to pay his debt and with a struggling love life on the side, Hapi painfully learns that he has to be careful in his decisions before it is too late, because there are choices one might make in this life that can never be taken back– proving the wisdom behind his father’s ususal quip that sometimes there are no second takes. 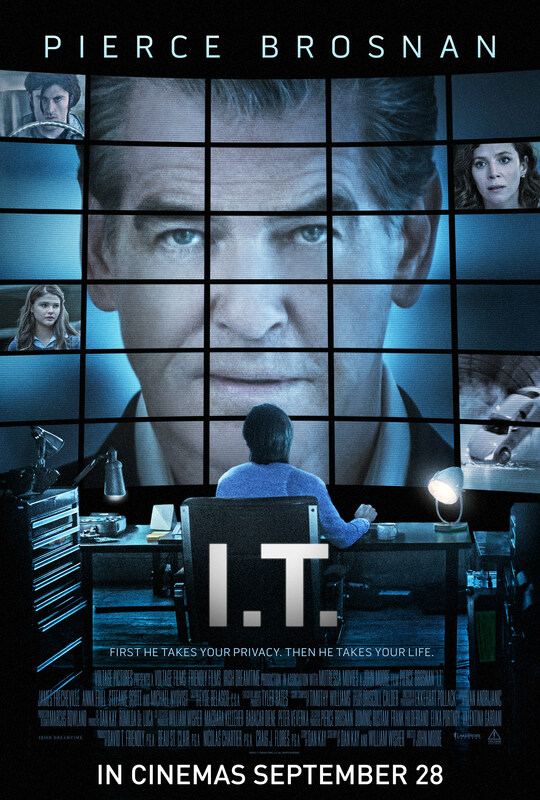 It seems that even without “Q” it seems like suave Bond actor Pierce Brosnan has his fill of the latest high-tech contraptions as he stars in his latest movie project, I.T. The problem is, unlike his 007 gear, that technology has been harnessed to harm him and his family. Mike Regan, played by Brosnan, a successful businessman living a quiet and comfortable existence, secured in the knowledge that this life is running smoothly because of all the gadgets that are installed in his office, home, and even the private aircraft that his empire is based on. This is disrupted when a talented I.T. specialist crashes into his life. Ed Porter (Frecheville) has the mad skills to fix any Information Technology bugs and Regan first hails him as a savior when he encounters a computer glitch, but soon ends up fearing for his life as the tech geek starts going on a destructive path. Among the gear he uses to stalk Regan’s family and cause them harm are those that they use and rely on every day such as home security cameras, computers, and even cell phones. As Porter becomes hell-bent on taking over Regan’s life by using tech as a tool to sow terror, moviegoers are made to reflect on how dependent modern life has become on gadgets and how these may eventually lead to humanity’s undoing. Brosnan and Porter are joined by a diverse cast of American and British actors, notably Anna Friel (as Kathleen Regan) of Pushing Daisies, Insidious and Disney’s A.N.T. Farm actress Stephanie Scott (as Nancy Regan) and Mission: Impossible – Ghost Protocol villainMichael Nyqvist. Taylor Swift fans are also in for a treat, as the pop idol’s good-looking younger brother Austin Swift is also in the cast of the upcoming technology thriller as Lance. Austin first caught online attention on the red carpet during the premiere of the Star Wars: The Force Awakens movie. I.T. is set to show in Philippine cinemas on September 28, 2016. The movie is exclusively distributed by Octoarts Films International. From Manila-Travel Time: It depends if travelling through public transportation (2-3 hours) or private vehicle plus toll fees (1:30-2:00) via NLEX to SCETEX. #QuestHotel: 4 Star but 5 Star Customer Service with world-class amenities. From mouth-watering international food at #CafeMequeni to beautiful view at the Golf Course. VLOG: You will appreciate their mouth-watering international cuisines from Sushi to Filipino favorites. From Swimming pool to Fitness Center.